In 2011, Florida firefighter Mark Taylor said he received a message from God that Donald Trump would become president. Taylor and Mary Colbert wrote “The Trump Prophecies”, which details the message Taylor said he received. 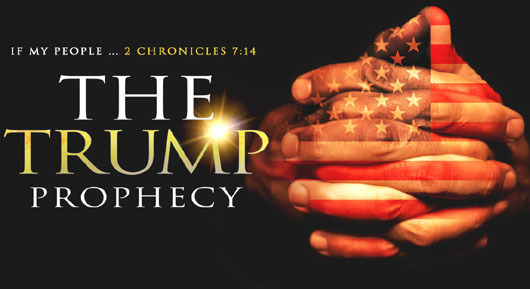 The book has been made into a movie – “The Trump Prophecy” – produced by Rick Eldridge of Reelworks Studios in Charlotte, North Carolina. “I knew it was going to be controversial, I knew it was not going to be an easy movie to make; I knew that people would respond like they responded, but I also knew that we had a nation that really needed to hear some messages of God’s intervention in our country,” Eldridge said. “The Spirit of God says I’ve chosen this man Donald Trump for such a time as this. For as Benjamin Netanyahu is to Israel, so shall this man be to the United States of America, for I will use this man to bring honor, respect and restoration to America. America will be respected once again as the most powerful, prosperous nation on Earth other than Israel. “The dollar will be the strongest it has ever been in the history of the United States and will once again be the currency by which all others are judged. The Spirit of God says the enemy will quake and shake and fear this man I have anointed. They will even quake and shake when he announces he is running for President. It will be like the shot heard across the world. “Then you will say what shall we do now? This man knows all our tricks and schemes. We’ve been robbing America for decades. What should we do to stop this? The Spirit says, ha, no one shall stop this that I have started, for the enemy has stolen from America for decades and it stops now. For I will use this man to reap the harvest that the United States has sown for and plunder from the enemy what he has stolen and return it back seven-fold to the United States. “The enemy will say, ‘Israel, Israel, what about Israel?’ Israel will be protected by America once again. The Spirit says yes, America will once again stand hand in hand with Israel and the two shall be as one, for the ties between Israel and America will be stronger than ever and Israel will flourish like never before. The Spirit of God says I will protect America and Israel, for this next President will be a man of his word. “When he speaks the world will listen and know that there is something greater in him than all the others before him. This man’s word is his bond and the world and America will know this, and the enemy will fear this, for this man will be fearless. The Spirit says when the financial harvest begins so shall the parallel in the spiritual for America.